Asghari, G., Keyhanfard, N. (2014). Seasonal variation of mono- and sesquiterpenoid components in the essential oil of Dracocephalum kotschyi Boiss.. Research Journal of Pharmacognosy, 1(4), 41-47. G. Asghari; N. Keyhanfard. "Seasonal variation of mono- and sesquiterpenoid components in the essential oil of Dracocephalum kotschyi Boiss.". 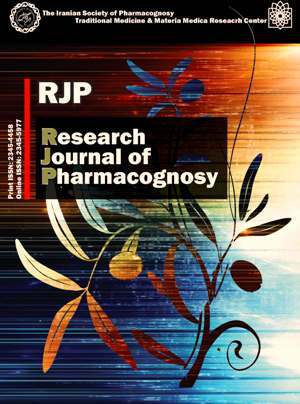 Research Journal of Pharmacognosy, 1, 4, 2014, 41-47. Asghari, G., Keyhanfard, N. (2014). 'Seasonal variation of mono- and sesquiterpenoid components in the essential oil of Dracocephalum kotschyi Boiss. ', Research Journal of Pharmacognosy, 1(4), pp. 41-47. Asghari, G., Keyhanfard, N. Seasonal variation of mono- and sesquiterpenoid components in the essential oil of Dracocephalum kotschyi Boiss.. Research Journal of Pharmacognosy, 2014; 1(4): 41-47. 1Isfahan Pharmaceutical Sciences Research Center, Isfahan University of Medical Sciences, Isfahan, Iran. 2Department of Pharmacognosy, Faculty of Pharmacy and Pharmaceutical Sciences, Isfahan University of Medical Sciences, Isfahan, Iran. Background and objectives: Dracocephalum kotschyi is a plant which belongs to the Lamiaceae family and exists mostly in south-west Asian countries, including Iran. This plant is used as antispasmodic, analgesic and anti-inflammatory to treat rheumatoid diseases. Methods: In order to investigate the impact of the harvesting time changes on the quantity and quality of mono- and sesquiterpenoid components of D. kotschyi aerial parts, ten samples were collected from cultivated plants from 19 April to 27 August 2013. Also samples of flower and root were harvested in order to investigate their essential oil components. The essential oils were obtained through hydrodistillation method. The components were studied and identified by GC and GC ⁄ MS systems. Results: The highest yield of the essential oil was obtained on 3 May (1.10% V.W) and the lowest on 28 July (0.29% V.W). Totally 55 compounds were identified in the essential oil while the highest percentage belonged to monoterpenes especially the oxygenated ones. Most variations were observed in geraniol (1.40-15.34%), geranyl acetate (trace-14.41%) and neryl acetate (0.62-17.51%). The major value in most cases belonged to geranial. Conclusion: the results of this study indicate that the harvesting time of plant is an effective factor in the quality and quantity of theessential oil of Dracocephalum kotschyi. Motamed M, Ghorbani A. Labiatae Family in folk Medicine in Iran. Tehran: Traditional Medicine & Materia Medica Research Center, Shahid Beheshti University of Medical Scineces, 2002. Zargari A. Medicinal plants. 4thed.Tehran: Tehran University Publication, 1990. Golshani S, Karamkhani F, Monsef-Esfehani HR, Abdollahi M. Antinociceptive effects of the essential oil of Dracocephalum kotschyi in the mouse writhing test. J Pharm Pharmaceutical Sci. 2004; 7(1): 76-79. Faham N, Javidnia K, Bahmani M, Amirghofran Z. Calycopterin, an immunoinhibitory compound from the extract of Dracocephalum kotschyi. Phytother Res. 2008; 22(9): 1154-1158. Saeidnia S, Gohari AR, Hadjiakhoondi A, Shafiee A. Bioactive compounds of the volatile oil of Dracocephalum kotschyi. Z Naturforsch C. 2007; 62(11-12): 793-796. Moghaddam G, Ebrahimi SA, Rahbar-Roshandel N, Foroumadi A. Antiproliferative activity of flavonoids: influence of the sequential methoxylation state of the flavonoid structure. Phytother Res. 2012; 26: 1023-1028. Trease GE, Evans WC. Pharmacognosy. 14th ed. London: WB Saunders Company Ltd, 1996. Penoel D. Aromatherapy for health professionals. 2ed ed. London: Churchill livingstone, 1999. Singh AK, Ram G, Sharma S. Accumulation pattern of important monoterpenes in the essential oil of Citronella java during one year of crop growth. J Med Aromat Plant Sci. Pitarevic I, Kuftinec J, Blazevic N, Kustrak D. Seasonal variation of essential oil yield and composition of Dalmation sage, Salvia officinalis. J Nat Prod. 1984; 47: 409-412. Emongor VE, Chweya JA. Effect of plant age on chamomile (Matricaria chamomilla L.) flower yield, essential oil content and composition. Discover Innovate. 1989; 4(1): 63-66. Cooray NF, Jansz ER, Ranatuga J, Wima Lasena S. Effect of maturity on some chemical constituents of turmeric (Curcuma longa L.). J Natl Sci Council Sri Lanka. 1988; 1(16): 39-52. Mehregan I, Ghannadi A. Essential oil analysis of Haussknechtia elymaitica Boiss. Fruits, an endemic plant from Iran. Rev Chim (Bucharest). 2013; 64: 81-82. Lin ZK, Hua YF, Gong GP, Gu YH. Chemical constituents of the essential oils from the leaves of Laurus nobilis and tendency in changes of constituents month by month. Acta Bot Sin.1990; 11(32): 878-882. Hassani M, Farahpour M, Mahdavi M, Hassani L. Study of essential oil content and composition of Dracocephalum kotshyi in different stages of plant growth in Mazandaran province. Adv Environ Biol. 2013; 7(8): 1584-1587. Asghari G, Houshfar G, Mahmudi Z. Seasonal variation of mono-and sesquiterpenes in the essential oil of Pycnocycla spinosa Decne. ex Boiss. Iranian J Pharm Res. 2002; 1: 61-63. Turysheva NA, Fedorovich NN. Essential oil and camazulene content depending on the development phase during harvest and storage duration of milfoil. Izv Vyssh Uchebn Zaved Pishch Tekhnol. 1996; 5/6: 20-21. Assareh MH, Sedaghati M, Kiarostami Kh, Ghamari Zare A. Seasonal changes of essential oil composition of Eucalyptus maculata Hook. Iranian J Med Aromat Plants. 2010; 25(4): 581-588. Fahlen A, Welander M, Wennersten R. Effects of light-temperature regimes on plant growth and essential oil yield of selected aromatic plants. J Sci Food Agric. 1997; 73(1): 111-119. Hussain AI, Anwar F, Hussain Sherazi ST, Przybylski R. Chemical composition, antioxidant and antimicrobial activities of basil (Ocimum basilicum) essential oils depends on seasonal variations. Food Chem. 2008; 108(3): 986-995.